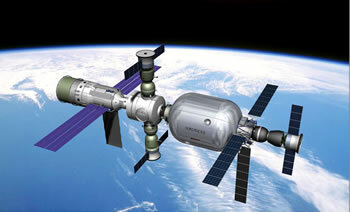 Bigelow Aerospace has been given payload approval for its Genesis inflatable space habitat by FAA-AST. Genesis weighs in at 1,360 kilograms and is approximately 4.6 meters in length by 1.9 meters in diameter; this is a one-third scale model. It's diameter will double once in orbit. The full-sized inflatable module, called Nautilus, will contain about 330 cubic meters of usable volume. The Federal Aviation Administration’s (FAA) Associate Administrator for Commercial Space Transportation (AST) conducted an extensive review; construction, materials, shielding, inflation process and the deorbiting of the test module were all studied and approved. “Obtaining the FAA-AST payload approval for Genesis is a first of its kind,” explained Mike Gold, corporate counsel for Bigelow Aerospace in Washington, D.C. “This will go a long way to establishing a good precedent for the inflatables,” he told SPACE.com. “This is a first step…but an important first step along the road that Bigelow Aerospace is traveling,” Gold added. To obtain the “favorable payload determination” by the FAA-AST, a review process took place over roughly an eight-month period, he said. Bigelow Aerospace plans to launch the Genesis inflatable module on the Falcon V now being built by Space Exploration Technologies; if all goes well it could launch in the fall of 2005. Eager to send your own payload into space? You'll want to check out the very cool Falcon Payload User Guide.